At Eye Site, our optometrists take pride in caring for the overall health and well being of your vision, and to do so we employ a variety of methods for examining and evaluating your eyes. 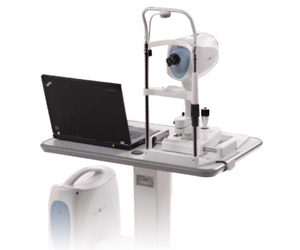 One of the procedures provided by our practice is Optical Coherence Tomography, also known as OCT. This painless, non-invasive procedure allows us to examine different structures within the eye in cross sectional views. This technology helps our doctors to detect and monitor a variety of eye conditions such as macular degenerationand glaucoma. Compared to older techniques, this new technology can help our eye doctors to make more accurate diagnoses and avoid invasive diagnostic methods, resulting in better care for your eyes. Optical Coherence Tomography works similarly to an ultrasound machine, but these devices use light rather than sound to create images of the retina. 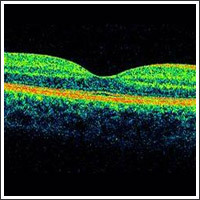 Light waves are passed into the eye, and the way in which light is reflected back is measured by the OCT to create colored, cross-sectional images of the retina. Your optometrist can look at these images to determine if the retina of the eye appears normal or has a problem. Those who use OCT must undergo specialized training to be able to interpret the images obtained. The structure of the eye includes transparent layers which allow light to pass through, but this makes it difficult using older technology to make measurements and diagnose certain conditions. OCT gives our eye doctors a new, non-invasive method of identifying specific conditions in our patients and creating baseline images that can be used to determine if changes occur over time.